DE RERUM NATURA: The Nature of Things, displays work created by the artist Ronald Forbes during his time as Leverhulme Artist-in-Residence at the Scottish Crop Research Institute, and has opened at the Hannah Maclure Centre in Dundee. 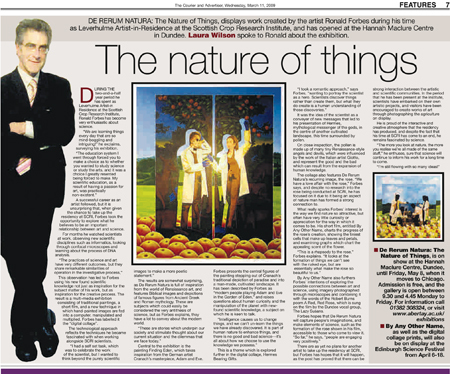 Laura Wilson spoke to Ronald about the exhibition. DURING THE two-and-a-half year period he has spent as Leverhulme Artist-in-Residence at the Scottish Crop Research Institute, Ronald Forbes has become very enthusiastic about science. “We are learning things every day that are so mind-boggling and intriguing I” he exclaims, surveying his exhibition. A successful career as an artist followed, but it is unsurprising that, when given the chance to take up the residency at SCRI, Forbes took the opportunity to explore what he believes to be an important relationship between art and science. For months he watched scientists at work, observing new scientific disciplines such as informatics, looking through confocal microscopes and learning about the process of DNA analysis. This observation has led to Forbes using his new found scientific knowledge not just as inspiration for the subject matter of his work, but as inspiration for the creative process. The result is a multi-media exhibition consisting of traditional paintings, a short film, and a new technique in which hand-painted images are fed into a computer, manipulated and multiplied. Forbes has labelled it the “digital collage”. The technological approach reflects the techniques he became fascinated with when working alongside SCRI scientists. The results are somewhat surprising, as De Rerum Natura is full of inspiration from the wor1d of Renaissance art, and features Biblical images and depictions of famous figures from Ancient Greek and Roman mythology. These are subjects which could easily be considered the very antithesis of science, but as Forbes explains, they have a lot to convey about the modern world. Central to the exhibition is the painting Finding Eden, which takes inspiration from the German artist Cranach’s masterpiece, Adam and Eve. Forbes presents the central figures of the painting stepping out of Cranach’s traditional depiction of paradise and into a man-made, cultivated landscape. It has been described by Forbes as “modern people playing Adam and Eve in the Garden of Eden,” and raises questions about human curiosity and the manipulation of the planet with newfound scientific knowledge, a subject on which he is keen to talk. It was the idea of the scientist as a conveyer of new messages that led to his presentation of Hermes, mythological messenger of the gods, in the centre of another cultivated landscape, this time surrounded by pollen. On close inspection, the pollen is made up of many tiny Renaissance-style angels and devils, which were influenced by the work of the Italian artist Giotto, and represent the good and the bad which can result from the expansion of human knowledge. The collage also features De Rerum Natura’s recurring image, the rose. “We have a love affair with the rose,” Forbes says, and despite no research into the rose being conducted at SCRI, he has focused on it due to it being an aspect of nature man has formed a strong connection to. What really sparks Forbes’ interest is the way we find nature so attractive, but often have very little curiosity or appreciation for the way in which it comes to be. His short film, entitled By Any Other Name, charts the progress of the rose’s creation, showing the tiniest cells that make up leaves and petals, and examining graphs which chart the appealing scent of the flower. There are as yet no plans for another artist to take up the residency at SCRI, but Forbes has hopes that it will happen, as the post has proved that there can be strong interaction between the artistic and scientific communities. In the period that he has been present at the institute, scientists have embarked on their own artistic projects, and visitors have been encouraged to create works of art through photographing the agriculture on display. He is proud of the interactive and creative atmosphere that the residency has produced, and despite the fact that his time at SCRI has come to an end, he remains fascinated by science. “The more you look at nature, the more you realise we’re all made of the same stuff,” he enthuses, sure that science will continue to inform his work for a long time to come.